We’d love your help. Let us know what’s wrong with this preview of Unwitting Zionists by Haya Gavish. 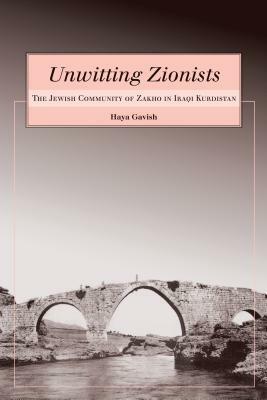 Unwitting Zionists examines the Jewish community in the northern Kurdistan town of Zakho from the end of the Ottoman period until the disappearance of the community through aliyah by 1951. Because of its remote location, Zakho was far removed from the influence of the Jewish religious leadership in Iraq and preserved many of its religious traditions independently, becoming Unwitting Zionists examines the Jewish community in the northern Kurdistan town of Zakho from the end of the Ottoman period until the disappearance of the community through aliyah by 1951. Because of its remote location, Zakho was far removed from the influence of the Jewish religious leadership in Iraq and preserved many of its religious traditions independently, becoming the most important Jewish community in the region and known as "Jerusalem of Kurdistan." Author Haya Gavish argues, therefore, that when the community was exposed to Zionism, it began to open up to external influences and activity. Originally published in Hebrew, Unwitting Zionists uses personal memoirs, historical records, and interviews to investigate the duality between Jewish tradition and Zionism among Zakho's Jews. To ask other readers questions about Unwitting Zionists, please sign up.